This one of the comfort foods of the family . When you are under the weather and want something simple and easy to prepare then this is the dish. 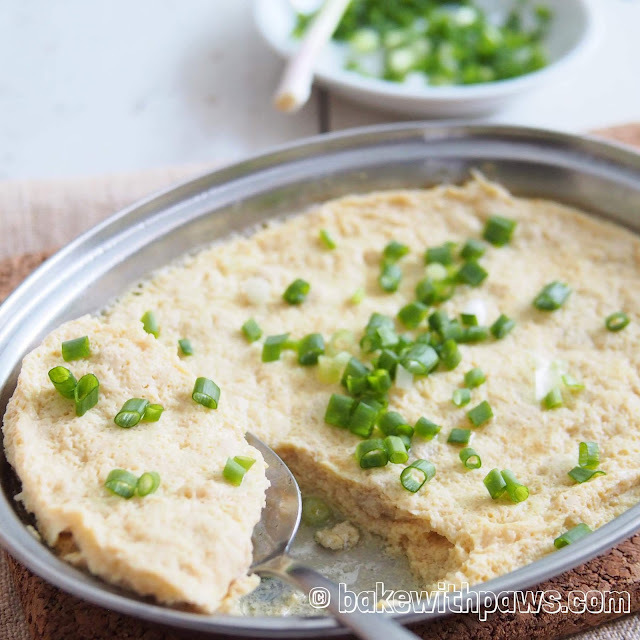 There are many versions of steamed egg with minced meat. Some would add tung choi (preserved cabbage) and others might add salted egg. I just want something simple. Eggs, meat, water and a little seasoning. The ratio of water varies. My mother in-law taught me 1 egg and half volume of water. I found it too dry and used ratio of 1:1. Old grannies would use the egg shell to measure the water so it is exact for each egg used. They would carefully remove just the top of the egg shell, pour the egg out and keep it intact for a precise measure of water. In a mixing bowl, beat the eggs. Add minced meat, water and all the seasoning. Steam over high heat for about 15 - 18 minutes. Remove from steamer. Sprinkle with some chopped spring onion and serve while still hot.